We have produced a series of monoclonal antibodies that bind to the ubiquitous basement membrane molecule, perlecan. These are useful as research reagents in various techniques such as ELISAs, immunocytochemistry and Western blotting to detect the presence and nature of perlecan produced by various cells. These will also be useful as probes of biological samples and may have utility as diagnostics of diseases like arthritis and cancer. Perlecan (HSPG2) is a multi-functional heparan sulfate proteoglycan, which was originally isolated from Engelbreth-Holm-Swarm (EHS) tumours. 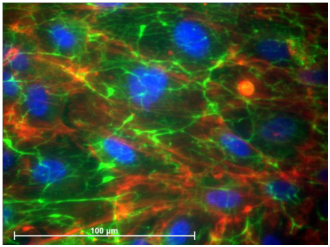 Perlecan is an extracellular matrix molecule and a major component of basement membranes. It is also found in mesenchymal organs and avascular tissues such as cartilage. Perlecan have been shown to interact with many growth factors to stimulate cell adhesion, migration, proliferation and differentiation. The global monoclonal antibody (mAbs) market for diagnosis and as reagents for research is $10 billion. The role of basement membrane proteoglycans (of which Perlecan is one) in cancer growth and angiogenesis1, as well as their potential as therapeutic targets in cancer has been described2. Cancer and arthritis mAbs accounted for over 75% of the total mAbs market. All the pharma majors now have mAbs projects in their R&D portfolio. 1.Iozzo RV, et al: Mol Cells. 2009 May 31;27(5):503-513. Review. 2.Fuster MM and Esko JD: Nature Rev Can 2005 July, 5:526-542. Immunogen: Perlecan (HSPG2) derived from the human embryonic kidney cell line (HEK-293). Species reactivity: human, bovine, not reactive with mouse, sheep, not yet tested in other species. Immunocytochemistry of endothelial cells (C11STH) fixed with 4% paraformaldehyde. The reactivity of 5D7-2E4 for the presence of perlecan is shown in green (FITC). Nuclei are stained with DAPI (blue) and actin fibres are stained red (rhodamine-phalloidin). NewSouth Innovations Pty Ltd is looking for partners to license the technology on a non-exclusive basis for research purposes, as well as potential licensees on an exclusive basis for diagnostic and therapeutic applications in cancer and inflammation.